we repair fiberglass shower stall pans/floor !!!!! Look at the Before and After on the next two pictures - Unbelievable!!!!! Porcelain is a white translucent ceramic that's applied to cast iron and then fired in a furnace at over 2200 degrees. It's a lot like firing pottery and setting the glaze. Nobody can re-porcelainize a bath tub in place - period. The tub would have to be removed and sent to the factory to be re-porcelainized. What happened to the shiny, smooth finish that was on the bath tub? 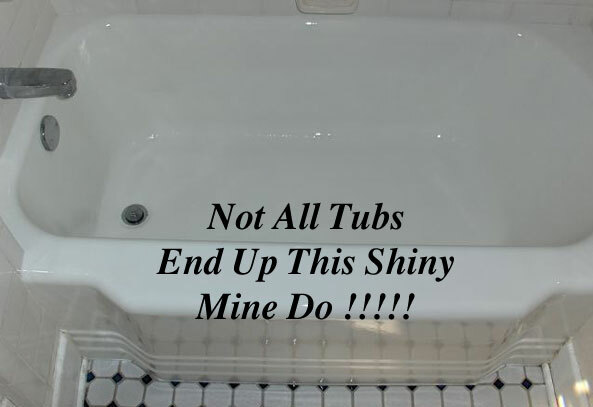 The shiny finish was removed either by using abrasive cleaners (comet, ajax or scrubbers) or the bath tub was treated with acid-base chemical cleaners such as Lime Away, CLR or any acid cleaner that you can purchase at your local hardware store. The way we cleaned our bathtub was passed down from generation to generation. Great-Grandma showed Grandma, who showed Mom, who showed Me how to clean a bathtub. The process was to wet the tub and shake an abrasive powder like "comet" around the inside of the tub. Then scrub the bath tub clean, rinse, repeat if necessary. Remember after the tub was dry, if you rubbed your hand in the bottom of the bath tub you could still feel the grit left behind? Well that grit is like sand paper. The glossy tub surface was sanded off. 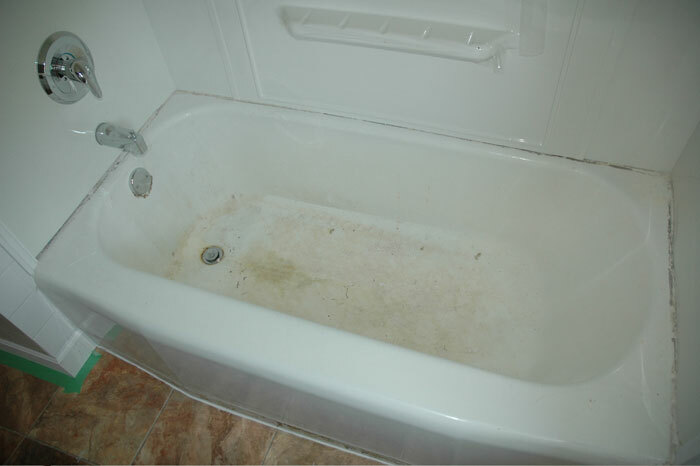 We only scrubbed the inside of the tub and not the outside. That's why the shine is still on the outside of most bathtubs. 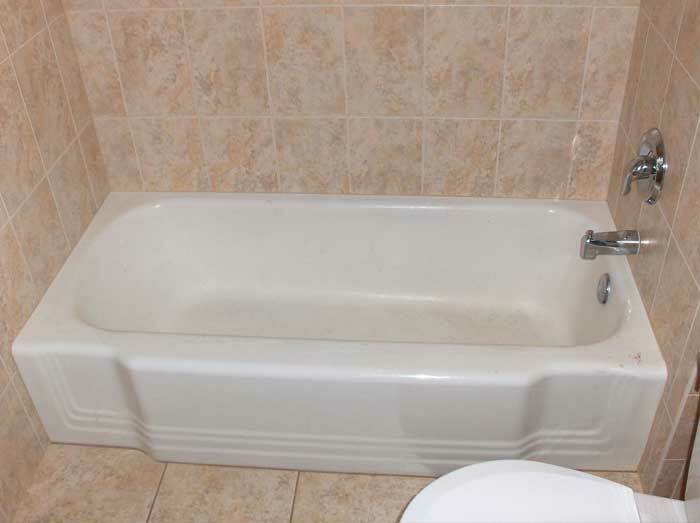 The bath tub (in most cases) is as old as the house. In fact it was the first item that was brought into the bathroom and attached to the walls. The walls and floors were built around the bathtub. So it's a huge undertaking to remove the bath tub and replace it; rarely done - if ever. The sinks were replaced and so were the toilets but not the bath tubs. To restore the ceramic look to a bathtub requires refinishing, reporcelainizing or re-glazing; all are references to the same process. 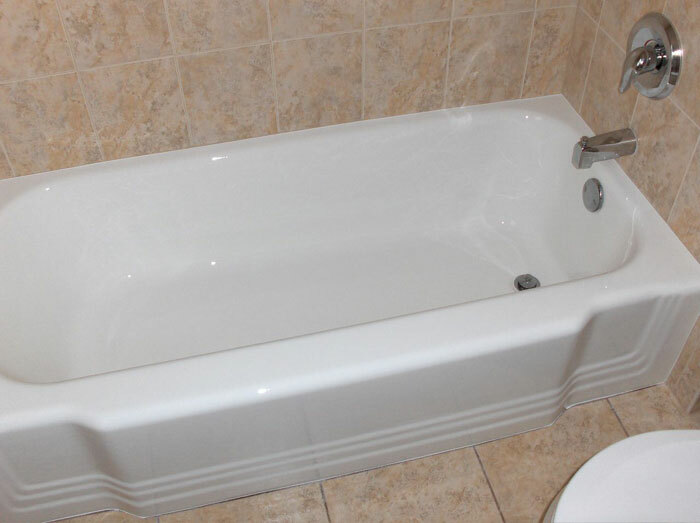 There are many different ways to prepare the bath tub for refinishing. The process that I use has passed the test of time. 1. 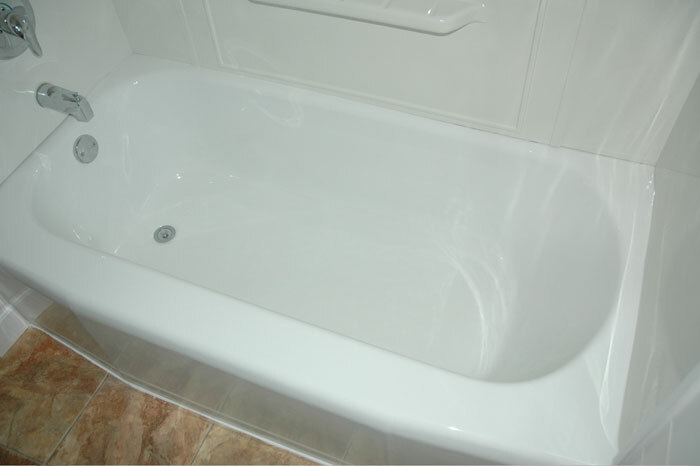 Thoroughly clean the bathtub and remove all caulking. This cleaning takes at least a 1/2 hour to complete. 4. Then I apply the best bonding primer that money can buy to the bathtub. This bonding agent fuses to the bathtub surface and provides a strong foundation for the top-coat mixture adhesion. This is the similar system that National Franchises use. The use of acid and epoxy based primers is old technology (Like running Windows 95 on your pc!). Things have changed for the better with the use of modern bonding agents. 5. We do not pull the drains in your tub. Regardless what you've been told it's a marketing gimmick. Here's why. One of the reasons the tub peels around the drain is because the epoxy primer was applied too heavily around the drain and didn't have enough time to set up before the shiny coating was applied. When the bonding agent is applied there is nothing better to insure proper adhesion. Secondly, chances are good that the drain has corroded in place. Trying to take the drain out in most cases will loosen up the plumbing behind the walls and may cause leaks. Make sure in advance that if the drain is pulled, your finishers have an active insurance policy that covers their plumbing work in your home. Most of the time only plumbers can get plumbers insurance. As you know, water damage is very expensive to repair. Lastly, even though they say they will pull the drain they might have you sign a waiver stating that they are not responsible for any water leaks in the future. Be Careful!!!! 6. If there are any chipped or worn areas in the tub we fill and sand them smooth upon the customers request. There is a small additional fee for this. 7. Then drop-cloths are installed on the floor and protective covers are carefully draped over the vanity and toilet. 8. Next Twenty-Eight ounces of top-coat mixture is applied to the primed surface (3-4 coats). The number of coats required is determined by temperature and humidity. 9. After the equipment is cleaned and put away, then drop cloths and protective coverings are removed. The area is wiped down, paper-work completed. 10. The bathtub can be used the following day. Look at This Beautifully Restored Claw Foot Bath Tub - Just Like New !!!!!! 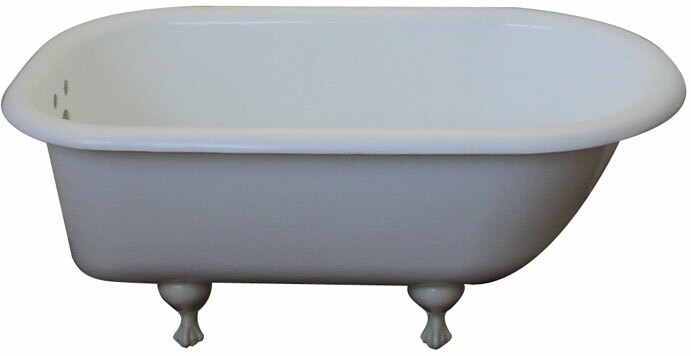 We also sell fully reconditioned antique claw foot bath tubs !!!!! !